A big, flavorful IPA, brewed with Pale and Crystal malts, and hopped with Bravo, Centennial, Cascade, and East Kent Goldings. Bold and Spicy. Served in a publgass. Pours a bronze/ruby color, very cloudy with a thick beige head. Moderate carbonation, head lasted a long time with a little lacing. Has a spicy smell primarily. Pine, lemon, and sweet maltiness are also present. Tastes great! Serious hops initially with a carmel/toffee back finish. Nice brief sweetness in the middle, then more spicy hops. It finishes less dry than it starts, leaving you wanting more. Good mouthfeel. Medium plus body, moderate oiliness in the middle, but it used well and I think adds to the beer experience. Easy to drink, complex enough taste without being too much. If you like IPAs I think this would be sessionable. I could drink a couple of them. I got this from mikereaser in Growling at the Moon '08. Thanks man, I'm really liking all these east-coast IPA's! Pours a very dark amber into my Surlyfest Stein. Initial pour has about a half inch off-white head. Head retention is decent. Has good lacing. Smells like an IPA with 113 IBUs should....hoppy. I get some citrus hops, and also a good bit of malt in the smell. Not too overpowering for such a high IBU brew. In the taste I get some sweet malty flavor, which leads to the hop bitterness in the back. The bitterness does linger quite awhile. The hops aren't too hard to handle here, but it just seems like there is something missing here. It goes from malty to hoppy, without much inbetween or after. Mouthfeel is ok. It coats the mouth nicely, and goes down good. It's not bad, and it's not great. Drinkability is average. It had good flavor, but if it had that one missing thing in the flavor, drinkability would be higher. Overall, a good solid IPA, my first brew from Sly Fox. I wouldn't mind trying this one again sometime, or their other offerings. Got in a trade from G311. This guys is the best! Pours a heavy dense bronze color with a thick yellowish white head and a ton of lacing. Smells of piny, woody, resinous hops and a little malt in there somewhere. Tastes of hops and a little lowly citrus hiding in there. Mouthfeel is medium with a bit of carbonation. Overall it is not as great as I was hoping. The worst Sly Fox brew I've tried to date. On tap at Niko's in Lebanon, PA on 6/12/08. A - Burnt copper/orange body with very minimal cascading carbonation and one-finger of bubbly white head that receded but left a thick coating of lace. S - Some citrus and pine hop notes with a little bit of caramel malt sweetness. The citrus became more apparent as the liquid warmed up a bit. Slight tinge of alcohol emerged as well. Overall, a pretty muted aroma for an IPA. T - Initial sweet flavor with a blend of citrus, piney and earthy hops and some peppery spiciness. M - Really thin mouthfeel. Kind of disappointed, actually. Decently smooth, but quite watery and lacking body. Very soft carbonation. Moderately bitter finish that lingers for a while on the palate. D - I remember liking this more in the past, but perhaps I hadn't sampled too many IPAs at that point. While it did get a bit more tasty as it warmed up, it's a pretty middle-of-the-road IPA. The mouthfeel really detracted from my overall enjoyment here. Perhaps the keg had been on a bit too long. Poured from a can (best by 7/3/11) into a pint glass. This beers pours a real nice amber colour. 2 fingers of thick off white head which eventually dissapates but never disappears completely. Minmal lacing. A real nice looking beer. Very light in the nose. A little bit of floral hops but that's about it. Not too impressed. Taste was much better than the nose! Very brief sweetness up front and than the hops come in hard. Lots of hop bitterness from here on out. Some grapefruit in the finish as well. Slightly dry. Moderate body and carbonation. Some stickiness on the lips. Sly Fox's offering in the IPA category is a solid one. I had this on tap at Coaxley's in Long Island last night with a crew of folks who's names I forget now. Sorry, friends! My girlfriend reminds me her friends name. But this beer is not much more memorable. Solidly built and pouring with a nice head, the appearance of Sly Fox's 113 is distinct in color. It's amber trending much more towards red than other IPA's I've had. It's a pleasant look, and inviting to drink. 113 smells like an IPA, but has a notably subdued hop aroma and only a bit of hops come through. The taste is about the same, with a lovely hops bite in the front, followed by a bit too much water and maybe not enough malts. It's solid enough with a medium-body and good carbonation, but the drinkability is less than perfect and has a weird aftertaste. Ultimately, when better options aren't there, I'll be happy to order a 113. If they are, I may take another route. Pours a reddish amber color with a large white head that had excellant retention. The head never really goes away as it settles to 1/2 inch cap. Moderate amount of sticky lacing is left on the glass. This beer is a looker. The flavor is not that upfront with the hops but I have to remind myself this is not going to be a West Coast hop bomb. Pine and floral hop aromas compliment the caramel and toasted malt. The flavor is a bit astrigent but I seemed to get use to as I made my way through the bomber as I did not really notice it as I finished. Nice malt backbone on this beer with toasted, bready, and musky notes. Just a touch of sweetness as well. The hops seem to be more for bitterness than flavor. More of a citrus flavor that I did not pick up any in the aroma. Medium body and nice carbonation. Feels right for the style. An interesting beer of the East Coast variety. The astrigency at first kind of turned me off and lowered the score, but as I got to spend more time with this beer, it grew on me. I've had the Route 113 almost every way Sly Fox packages it up: can, bottle and draft. This review, is based on the bottled version (22 ounce), split by Nick last night. I believe these may be approaching around 2-3 months or so. A: Clear copper body with a seriously foamy and rocky off-white head. Some floating sediment is in the glass, something I never noticed before poured from the can or on-tap. Is the bottle version bottle conditioned? I'm not sure, either way it detracts from the appearance a bit. S: Piney and resiny hop notes come through big, leading you into what is no doubt going to be a bitter IPA. Grassy and floral elements stand on their own, with a subtle caramel malt based backbone to the aroma. T: Big earthy and grassy hop flavors coat the palate but are balanced by a rather substantial malt base, evident more so in the taste than the aroma. Sweet caramel and some just downright bitterness lingers into the finish, leaving a dry and sticky taste on the palate. M: Medium-bodied, good carbonation, dry and sticky in the finish. Nothing too out of the ordinary and nothing holding back the mouth feel - good. 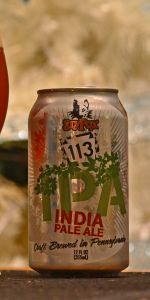 The Route 113 IPA seems to be standard fair among the massive amounts of IPAs on the market. If you're looking for a more earthy and grass-forward bitter IPA, this is the one for you. I wish the malt would have balanced out the harsh bitter notes of this beer a bit more, as it seems very one dimensional. Pours a dark amber with little head, but lots of bubbles clinging to the side of the glass in the beer. Smells hoppy and malty, kind of earthy, with a heavy sweetness threatening from behind. Hits lightly sweet and spicy, in the middle the hops really come out with bitterness and pine, then finishes bitter with some hoppy pine. There's very little of the heavy sweetness that you'd get in the smell. It's a good contrast. While the flavors aren't all that, the consistence with contrasting accessory flavors make it very intersting. It has a medium weight on the tongue, especially at first, but finishes somewhat crisp with lingering bite. By individual flavors this one doesn't really stand out, but the interplay adds a lot. I like it overall, Lots of IPA's out there and its a bit different than what I usually pickup. That may be why its standing out as a nice drinking beer. What a pour - hazy, burnt orange, with a thick tan colored head, that's rich and creamy. Smell those hops, 'good ole hops'. Didn't get any malt aroma from this beer. Taste is good, I've had better, but this ain't bad stuff. Priced reasonably, which makes it taste better than most of it's 'peer beers'. Creamy in the mouth up front, then some sweetness of malt, followed up with a real good hoppy bite at the finish. I want more, 22 oz at 7% abv is usually enough for me, but I still want more! Taste: pleasant, hoppy, hints of citrus and maybe thyme?